The ASTM E 1678/NFPA 269 smoke toxicity fire test apparatus is designed to assess the toxic potency of combustion products from various materials or products, presented as planar specimens. The apparatus consists of a combustion cell and an exposure chamber, connected by an enclosed passage (chimney). External to the combustion cell, which contains the specimen platform, are placed 4 radiant heat lamps and a load cell. The exposure chamber has six tubular housings, provided for exposing targets. Optional gas analysis instrumentation, for determination of smoke toxicity, can be purchased separately. The combustion cell, exposure chamber and chimney are assembled in such a manner that they may be separated for cleaning purposes (after a test). Exposure Chamber: a clear polycarbonate box, 200 liters nominal volume, with inside dimensions of 1.22 x 0.37 x 0.45 m (48 in. x 14.5 in. x 18 in.). It contains two doors: one in the front wall near the connection to the combustion cell and one in the end wall nearest the target housing ports. Combustion Cell: a horizontal quartz tube with a 127 mm (5 in.) inside diameter and approximately 320 mm (12.5 in.) long, sealed at one end and with a large standard taper outer joint at the other end. Chimney: a stainless steel assembly connecting the combustion cell to the exposure chamber. Smoke shutter: inside the exposure chamber, to close over the chimney opening. Radiant Heaters: The active element of the heater consists of four quartz infrared lamps (with tungsten filaments), rated at 2000 W/ 240 V. The lamps are encased in water cooled holders with parabolic reflectors. Spark Igniter: located inside the combustion cell, directly above the specimen. 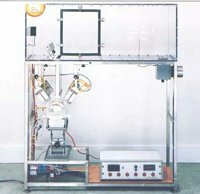 Specimen Holder and Load Cell: The specimen holder is a stainless steel assembly approximately 76 x 127 mm (3 x 5 in. ), inside dimensions, and 50 mm (2 in.) deep. The specimen is backed by a layer of ceramic fiber blanket (nominally 65 kg/m3 density). The specimen holder is placed, for testing, on a platform, inside the combustion cell and under the lamps, and connected by a rigid rod to a load cell, for continuously monitoring sample mass.